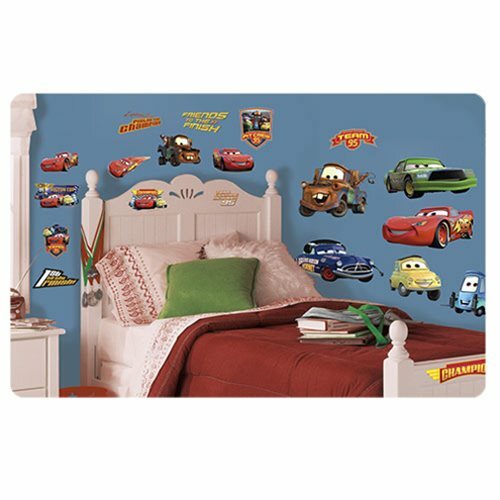 Bring the action and adventure of Disney-Pixar's Cars into any room with these officially licensed Disney Cars Piston Cup Champion wall stickers! Lightning McQueen, Mater, and the rest of your favorite Cars characters will help make your child's bedroom into a Cars-themed hideaway in just seconds. The decals apply easily to any flat surface, and can be removed or repositioned multiple times without damage or residue. This product is printed on clear material for a "stenciled" look. White or light colored walls are recommended for best results. Decals range in size from 3 1/2-inches wide x 2 1/4-inches tall to 13-inches wide x 6 1/4-inches tall. Ages 13 and up.